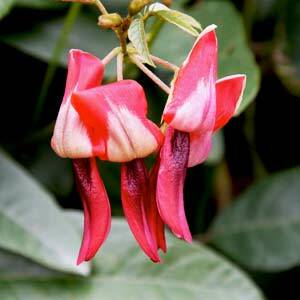 With very attractive ‘Dusky Pink’ flowers and good deep green foliage Kennedia rubicunda is aptly named the ‘Dusky Corl Pea’. Flowering in spring with pea like flowers it can be grown either as climbing plant where it has a support or a sprawling ground cover, Kennedia rubicunda seems to be most useful in landscaping as a climber. Comfortably covering around 3m by 3m in good conditions the foliage is dense through the year. Found in the eastern ranges from Victoria through to New South Wales, given support and good soil it will cover a trellis or a column fairly quickly. Flowers are a dusky red to crimson, attractive to birds for the sweet nectar. Long seed pods follow the flowers and this can be an issue in bushland settings where the seeds will self sow. Deep green foliage is attractive year round and Kennedia rubicunda makes a very useful climber in an urban setting. 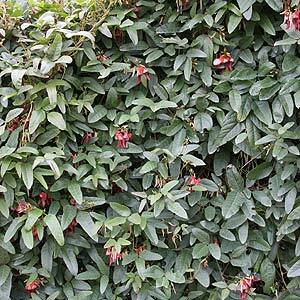 Sprawling Ground cover or climber in urban areas, or in commercial developments. Pictured right we have K.rubicunda used a climbing plant, very good coverage.